We always need a virtual machine to run a various operation on an operating system. The need for a virtualization varies according to the usability of the user. Mostly people use Virtual Box or VM-Ware to create a virtual machine on their PC. This Method is old, and we need to install one of this software on PC to create a virtual machine on the computer. This is a very lengthy and time-consuming process. A Question is running in your mind. ” what we do ?” Am I right? 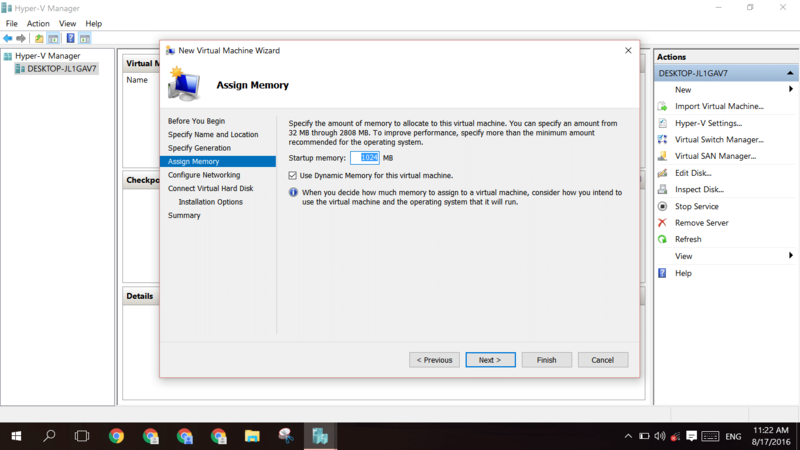 Today I am going to solve your this problem of virtual machine and also, I am going to introduce you to a new method to set up the virtual machine on Windows 10 without Virtual Box and VM- Ware. So Introduce yourself with Hyper-V a new and 100% working solution for the virtual machine. Hyper-V allows You To Windows Virtual PC for Windows 10 without any software. Hyper-V is a Virtualization feature which is hidden inside your Windows operating system. Hyper-v is a part of Windows Server 2008 and Windows 2012. But you can Use it on your Windows 8. 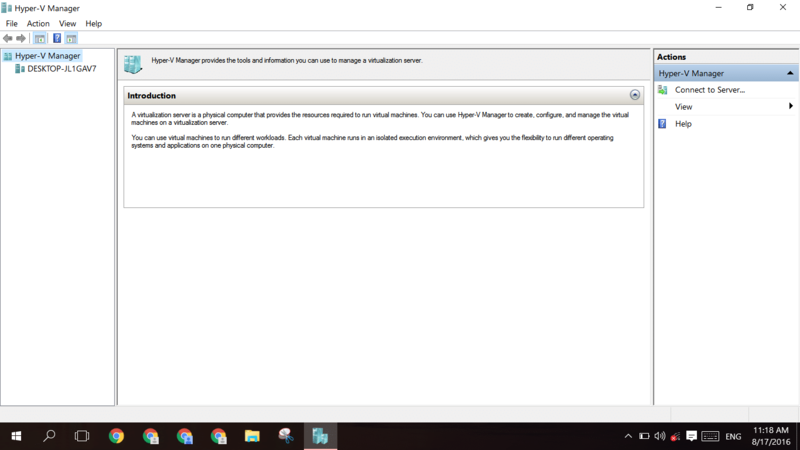 This virtualization feature of Windows operating system is not present in Windows 7. Hyper- V is only supported by the Professional and Enterprise Versions of Windows 8, Windows 8.1 And Windows 10. Its requirements are your Hardware”CPU” must support virtualization. This feature comes with all new CPUs. Default does not enable this feature of Windows operating system. So to access this fantastic feature of Windows operating system. You have to follow these steps. Go to Control Panel > Programs > Programs and Feature and open it. Click on Turn Windows Feature on or Off. 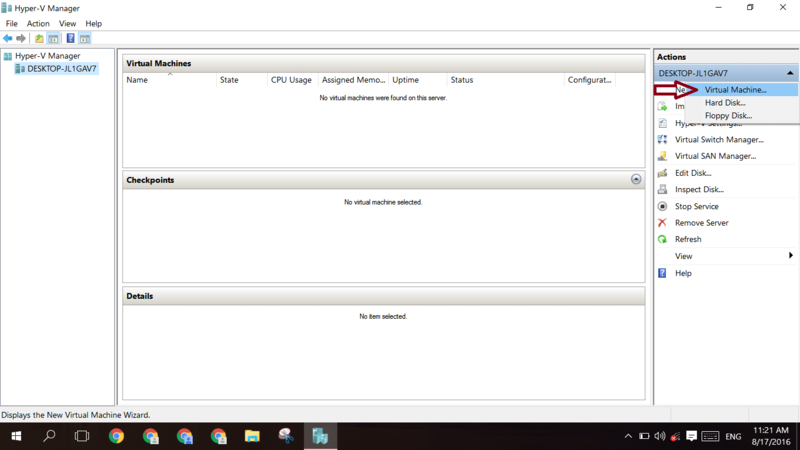 Find and click on Hyper-V check box. To enable Hyper-V on your PC by Using PowerShell Follow These Steps. Right, Click On PowerShell > Runs as Administrator. Type following command in PowerShell. 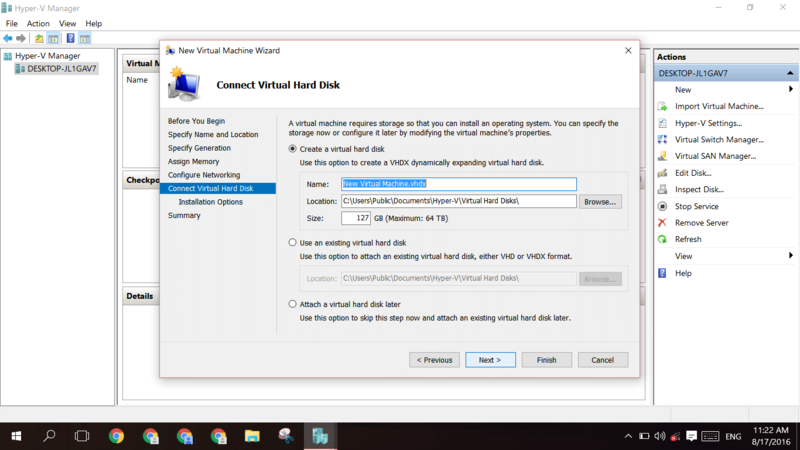 Command:   "enable-WindowsOptionalFeature -Online -FeatureName Microsoft-Hyper-V -All"
To Create Virtual machine you have to follow these steps and how to set up a virtual machine. Open Hyper-V Manager from the start menu by typing “Hyper-V Manager“. and click on Run as Administrator. To create a new virtual machine you have to click on New tab on your right pane. When you click on it, a “New Virtual Machine Wizard” windows will open. Then Click On Next button. In This step, you have to enter the name and location for your virtual machine. In this step, you have to allocate the memory. You can assign the memory according to your need. Pre-allocated memory is enough to run a virtual operating system or you can manipulate it according to the need of memory. Because some of us Virtual machine to run projects which having lagre memory need. If you are one of them then this option is best for you otherwise rest it default. Setting Up Network: In this step, you can configure your network in a virtual machine. 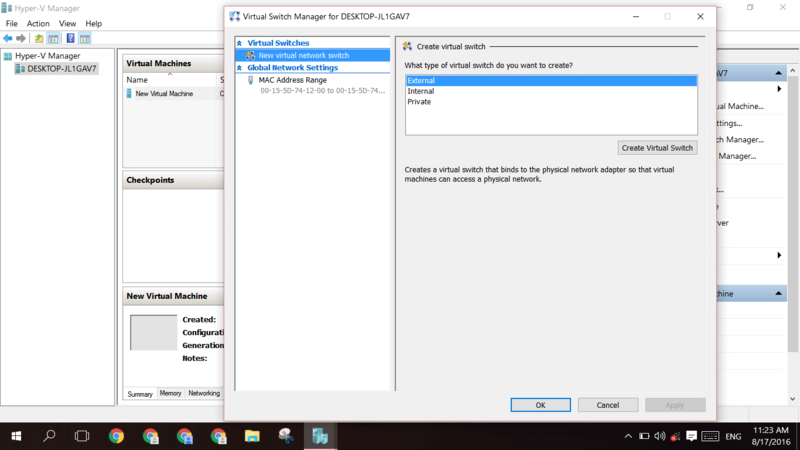 See how to Configure Network in Hyper-V virtual machine. If you want to access Network in your Virtual Machine, then you will Need to make a virtual switch by click on Virtual Switch Manager. Its ask you “what type of virtual switch do you want to create?”. Then You have to select External and click on Create Virtual Switch Button. Give a name to your virtual switch and also its gives you the option to add some note regarding your virtual switch network. One Thing you have to ensure that your network was working properly. In this portion, you see Installation Option-click and open it. If you have a guest operating system DVD or an ISO Image, Choose to Create a Virtual hard disk. Click on Next then selects Install an operating system from a bootable image file. Give the path of your ISO image file then click on Finish button. When you finished all the steps the Hyper-V Manager will Showing your virtual machine. To Boot you have to select it and click on start from action pane on your right sidebar. 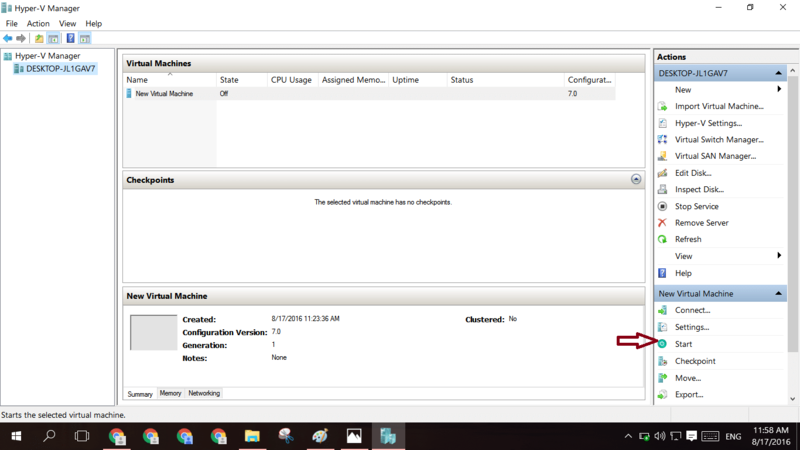 Note that when have done your all work with your virtual machine, ensure that you Shut Down it correctly. Because Virtual machine takes much amount of hardware resources in the background of your operating system. So you have to shut Down your Virtual Machne correctly by following these steps Right Click on your Virtual Machine > Turn Off, Done. I give the best of best guide to Use, Install, Run Hyper-V Virtual Machine on Windows 8, 8.1, 10 and how to enable virtualization on Windows 10. SO you not need to download virtual machine software for Windows 10. All the steps are explained correctly, and 100% is working. If anyone can face problem regarding this process. Then tell me your issue by commenting in the comment box. I will solve your problem. And one thing for me you have to do, please like and share this article on social media. I was waiting for your response.